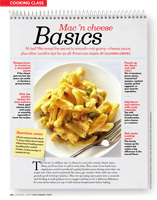 Cooking Light has scores of delicious, nutritious recipes in every issue! 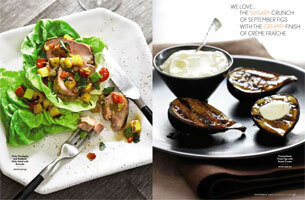 Find out why it is the most popular food magazine in the country. Cooking Light is a trusted source for those who want to cook and enjoy healthy, delicious food. Whether you’re in a hurry to prepare a quick and easy dinner tonight or need a game plan for the perfect party, Cooking Light offers nutritious, kitchen-tested recipes for every day living or special occasions. 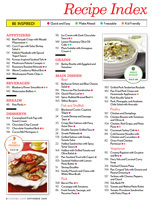 And whether you’re a novice or an adventurous cook you’ll find great food and healthy lifestyle tips in every issue. Recipe Index is positioned immediately after the Table of Contents and includes recipe listings by category, including tags for Quick and Easy and Kid-friendly, as well as Staff Favorite recipes. Editors’ Dozen is a seasonally oriented selection of 13 fun and healthy food, fitness, and lifestyle items, products, and news. Superfast features 20-minute dishes that are simple, fresh, and easy entrées. The Stress-Free Zone provides strategies for dealing with everyday stressful situations, such as staying on schedule during a hectic morning, job interviews, medical tests, and more. Ask Our Dietician answers to questions from readers about their dietary dilemmas. Moves of the Month shows effective, simple workouts, along with gear and nutrition tips. Taste Test evaluates food products, such as pasta sauce or soy sauces and recommends those offering the best quality, value, and nutrition. Travel explores the flavors of top destinations, such as San Francisco or Atlanta, through its iconic dishes. Includes travel recommendations and recipes that exemplify the area’s cuisine. Wine matches favorite foods with appropriate wines. 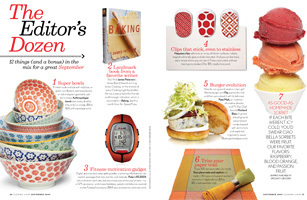 Seasonally chosen with references to recipes in the issue. Beauty offers ways to look younger and improve your appearance and well-being. Menu Navigator examines popular restaurant foods and helps you make the healthiest choices. New Uses for Everyday Ingredients discusses three common pantry ingredients and provides interesting and lesser known uses for each. Kitchen is a roundup of useful tools, including equipment, gadgets, and other favorites. Dinner Tonight is Cooking Light’s most popular department with 7 time-tested, fast meals with tips and game plans to make life easier. Plus shopping list. 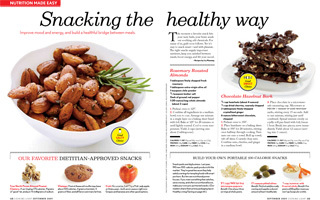 Nutrition Made Easy features healthy eating tips with recipes devoted to a single topic. Cooking Class shows step-by-step methods for making a popular comfort food, and provides ways to build on the basics for more creative variations. Recipe Makeover lightens a classic recipe but maintains all the taste of the traditional version. Budget Cooking offers recipes that feed 4 for under . Reader Recipes features the very best recipes from the more than 12 million readers of Cooking Light. Kitchen How-To illustrates quick cooking techniques. Everyday Vegetarian showcases vegetarian fare that suits the season. Recipe Hall of Fame highlights one recipe that is absolutely, positively best of class. Feature Articles in Cooking Light offer highly evocative and beautiful photos of food and recipes, and delve in depth with topics ranging from seasonal cuisine to nutrition, and from cooking instruction to profiles of intriguing people in the food world. The entire feature sections in our June and November issues are presented in cookbook format, as well as special sections on how to start the year out right and the best of the holidays. The new design of Cooking Light features photos with every recipe and a design format that emphasizes light and airy pages, brief text and fun graphics. The food comes alive on the pages thanks to vibrant colors and natural light settings, and cooking technique is made simple with step-by-step instructions that couldn’t be easier to follow. The focus is on reader service, and articles offer tips, shopping advice, nutrition facts, cooking short cuts, and hundreds of helpful bits that make Cooking Light a great learning tool and source of inspiration. Cooking Light contributors range from internationally renowned chefs to home cooks. They also include nutrition experts and award-winning science writers. A variety of best-selling cookbook authors and recipe developers are regular contributors, as well. Cooking Light has top 5 advertising categories that reflect the magazine’s editorial focus on healthy living. The top category is food and beverage followed by DTC/OTC, home, travel and beauty. Cooking Light is recognized as a trusted brand with a 22-year heritage. In 2008, Cooking Light received the Media Excellence Award from the American Dietetic Association, marking the first time the world’s largest organization has presented the distinction to a consumer magazine. Over the years Cooking Light has been honored with multiple industry and consumer awards including: IACP Cookbook Award, Eddie Awards Gold Winner, AdWeek Hot List: Top 10 Magazines, Amazon.com’s 4th Most popular subscription and MIN “Most Notable Launch of the Past Two Decades”. Cooking Light‘s brand power extends beyond the pages of the magazine, being named a 2009 Official Honoree by the prestigious Webby Awards. Seventeen is a general service magazine for young women emphasizing fashion, beauty and lifestyle information, including health, food, careers, relationships, sports and entertainment. Seventeen readers want a guide where they can find everything important, all in one place. Seventeen‘s fashion-conscious, trendy readers are interested in the latest beauty and style trends. They want to know what’s hot in music and movies and get the latest celebrity gossip. Seventeen readers are sophisticated and identify with social issues, political dilemmas, and world news. And… Letter from the Editor, letters from readers, Traumarama, horoscopes. Seventeen expertly blends engaging articles with beautiful photos. Learn how to do anything with easy directions and step-by-step pictures… craft your hair into the perfect style, strengthen your core for flat abs, and apply makeup to get your perfect look. Each section of the magazine is clearly identifiable, so you can quickly find your favorite articles. Leading the diverse Seventeen team, Ann Shoket was named editor-in-chief of Seventeen magazine in January 2007. Under her helm, Seventeen continues to represent an important rite of passage, helping more than 13 million readers grow up to be confident, self-assured young women. Over the past five decades, Seventeen has helped shape teenage life in America. Seventeen has represented an important rite of passage, helping to define, socialize and empower young women. Seventeen has been a significant force for change—creating notions of beauty and style, proclaiming what’s hot in music and movies, identifying social issues, celebrating the idols and icons of popular culture. One of the most buzz-worthy programs is the “Seventeen Body Peace Project,” a year-long initiative to help girls stop obsessing about what their body looks like, start appreciating it for what it can do, and ultimately make peace with their bodies. Seventeen also partnered with MySpace, the largest social networking site, to launch the ground-breaking Web reality program “Freshman 15,” which gives millions of teens an inside scoop on the often overwhelming emotional and lifestyle changes taking place at college. Seventeen readers have a passion for a variety of products. Advertisers include fashion, retail, footwear, accessories, beauty and health products. These range from luxury goods to everyday essentials targeted to fashion conscious, trendy young women. A delicious balance of cooking and must-have nutrition features, EatingWell is the award-winning magazine where good taste meets good health on every page. Each issue is filled with dozens of delicious and nutritious recipes, smart shopping tips, healthy-in-a-hurry menus and much more! Beautiful color images illustrate never-fail, full-flavored recipes for healthful everyday eating and entertaining. What’s for dinner? Is it healthy? Is it easy? If you ask these questions, EatingWell is for you. The magazine “Where Good Taste Meets Good Health,” EatingWell delivers the information and inspiration its 350,000 paid subscribers need to make healthy eating a way of life with great, easy recipes (most take 45 minutes or less), the latest nutrition science, gorgeous photos and crisp, evocative prose. Fresh: News from the world of food. Healthy in a Hurry: Fantastic, quick recipes that meet our strict nutrition parameters yet are delicious and simple to make. Nutrition News to Live By: Words of advice from top scientists. EatingWell by Season: Delicious recipes based on what’s in season and fresh now. Special Report: In-depth, award-winning journalism about new findings in nutrition science, where our food comes from and how it is produced. Feature Articles: EatingWell examines the connections among food, its origins and its impact on communities. 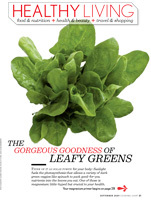 These are some of the recent topics covered in EatingWell features: Do You Really Need Supplements?, The Search for the Anti-Aging Diet, How to Grow Your Own Salads, Why Buffalo Is Back. EatingWell is rare in that EVERY recipe is accompanied by a beautiful, realistic photo showing what the dish will look like. Luscious photos are part of the brand, along with simple recipes and strong writing. Award-winning writers (Rachael Moeller Gorman, David Dobbs, Bill McKibben, Rowan Jacobsen) and nutrition science professionals, such as Marion Nestle, Dr. Philip Ades, Brian Wansink, come together in the pages of EatingWell. Unlike Cooking Light, EatingWell is the only magazine to focus uniquely on the intersection of food and health and “origins”—where the food comes from. EatingWell‘s pages are at least 60% editorial. The remaining 40% is paid advertising from companies promoting healthy foods, products and lifestyles, often in the natural and organic space. EatingWell has been named one of the top 3 food magazine for the last 3 years (Folio: Eddie Award). It also won a James Beard Foundation Journalism Award for nutrition reporting in 2008 and an IACP Bert Greene Award for best food essay. The EatingWell Diet was named one of the top 10 best diet cookbooks last year by Health Magazine and CNN.